← Shuck the Oysters and play with the PIgs! MARVELLOUS food and drink experiences…that are in store for all who go to BankSA Feast for the Senses today on Saturday 28 April & Sunday 29 April, 2012 from 11am to 5pm on the right bank of the picturesque River Torrens. This area is just behind the luxurious Intercontinental Hotel and Adelaide Railway Station. There are over 100 food experiences to relish! There shall be Kids in the Kitchen presented by San Remo with Sydney sisters’ Sammy and Bella Jakubiak of TV Channel 7’s hit show “My Kitchen Rules 2″. The youngsters will learn simple and delicious ways to prepare food. I woke up at 07:00 this cool, bright and sunny morning, and then had a nice run from the luxurious Intercontinental Adelaide along historic North Terrace to look at the War Memorial decorated with wreaths from ANZAC Day and other historic monuments & statues. A light breakfast in the Media Center of Cappuccino freshly made and some yoghurt and gluten free Tropadelic Artisan Cereal with papaya, dates, mango, biodynamic brown rice…mmmmm, and I am ready to go to BankSA Feast for the Senses which starts at 11:00. I can see the white pointed tents all set up from my suite in the INtercontinental Hotel. Feast for the Senses by the River Torrens was a BLAST! Sensational sights, smells, super food and splendid wines! Sunshine and blue skies and a cool breeze. What more can any sane person want? There was even a Venetian Gondolier ferrying people on the river! My flabber was absolutely gasted! The Gondolier didn’t look Italian, Ha! Ha! I went on a rollicking, gorgeous Gourmet Safari tasting so many foods and wines! At “Let Them Eat” I saw the cheerful lady chefs making hand rolled Falafel, otherwise known as Sharwarma and other yummy Middle Eastern goodies, all cooked a la minute. “How about La vie en rose?” I replied. I was impressed with the crunch and flavour quality of the organic olives and almonds at Adrian & Robin Strachan’s Willunga Hills Organic stall. It was so good I had to buy some. They have been around since 1978. I sampled Chicken Yakitori with Teriyaki Sauce from Ginza Japanese and lovely fork tender breaded Calamari with fat chunky chips so fluffy in the middle served in a paper cone, from Dinkydi Oysters & Seafood. The Green Room for VIPs was lovely with lashings of food and wine and cheese sausages too! The whole event was very well organised and it seemed like all of Adelaide were there to enjoy “la dolce vita” and gourmet food and wine. Feast for the Senses was that and more! Lunch found me in the serene suburb of Pennington about 10 km NW of Adelaide city center. Vietnam is the name of the restaurant and it is known mostly to locals for its authentic Vietnamese food. More to follow…The founder and owner escaped evil communist persecution in Vietnam and was one of the “Boat People”. 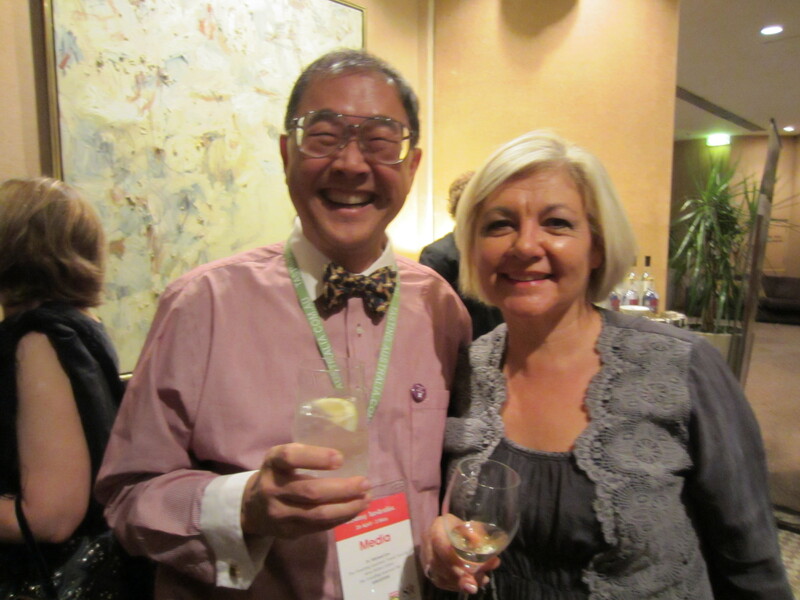 MORE than 270 food and wine lovers attended including bubbly & bright Jane Jeffreys, Chair and Chief Executive of the South Australia Tourism Commission who told me, “I love the food in Singapore, you have the best “Street Food” and I have been going to Singapore almost every year…since 1974!” There was a whole tuna for sashimi, sushi, Wagyu Beef Yakitori, Prawns and my favourite…Goat Meat Pie with a black olive inside! I loved too the KIS which stands for Kangaroo Island Spirits offerings of KIS Wild Gin concocted with Italian Juniper, Angelika Root, Cardomom and 20% of Boobiala. Boobiala is a native aboriginal juniper like berry hand picked on Kangaroo Island. Only 43% alcohol, Ha! Ha! and slightly smokey and different from the London gins. Gin & Tonic with a twist was most refreshing! Outback Pride showcased aboriginal “Bush Food” like River Mint leaves, lemon Myrtle, Quandong, Warrigal Greens and other appetising and unique foods. I tried them all and also ran into my friend, Haydyn of Bookabee Tours who is also working with Outback Pride to promote these native goodies. Supper found me in the Intercontinental’s premier Japanese restaurant that has been around for over 25 years and also won the Hall of Fame Award for 2012! Capable and modest Executive Chef Tony Hart dined with me and we had lovely and crisp Teppanyaki Broccolini with Garlic Flakes,Waygyu Beef flambeed with Brandy, naturally sweet Moreton Bay Bugs ‘teppan-ed’ in Chardonnay and other deliciously delightful dishes! Chef Tony told me about his experiences in Fiji where he worked for 5 years and how the natives would drink Kava, a narcotic drink and then turn up for work glassy eyed like zombies! This entry was posted in Fabulous Food and Gorgeous Drinks, Travel. Bookmark the permalink.